We are dedicated to ensuring that feeding your dog a nutritious and healthy diet is as convenient and cost effective as possible. With this in mind, all of our raw dog food products can be delivered to your door, at a time that works for you, meaning it’s never been easier to feed your dog a nutritious diet. So if you need your raw dog food in a hurry, you have certainly landed in the right place! Ideal for dogs of all ages, a raw dog food diet can also be adapted to suit the individual needs of your working dog. 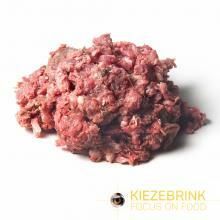 Here at Kiezebrink UK, we offer a fantastic choice of raw dog food including day old chicks, rabbits, chickens, and ducks, as well as beef, horsemeat, lamb, game, and fish. Using only the highest quality and fresh ingredients, all of our products are frozen immediately after production to ensure all vitamins and nutrients are fully retained. Here at Kiezebrink UK, we always put the needs of our customers first, and go above and beyond to deliver a raw dog food delivery service that works for you. We will deliver your order directly to your door, at a time that works for you. And, if you order before 11.30am during the week , we’ll even deliver the next day! Check our extensive range of raw dog food delivery today, and if you require any further information about any of our products, please do not hesitate to get in touch.